In her current show at Klaus von Nichtssagend, Jennifer J. Lee also evokes the pixel by painting on extremely coarse jute – the weave of the material together with a moderately dry brush creating the lo-res effect. To me, these paintings were at their best when the depicted subject had a surface that was absolutely opposed to the fabric on which it was painted – things like plastic chairs, brass horns, and various kinds of glass. 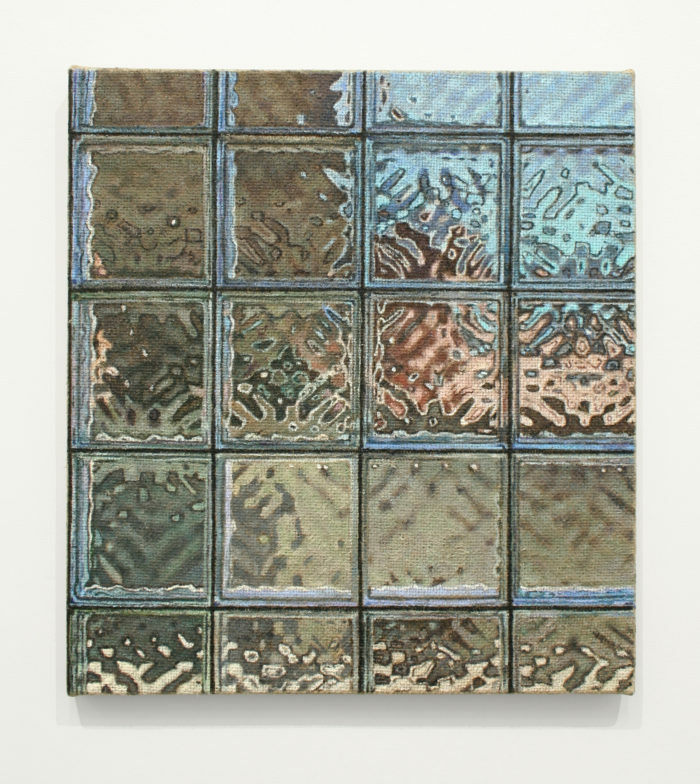 Window III(2018), the largest painting in the show at 21” x 19,” was quite amazing, creating an extremely convincing illusion of glass brick, with an indistinct landscape visible outside. In a 101-level painting the class, one of the first things one learns is that surfaces should be prepared according to what you’re planning to paint on them – Lee turns that formula on its head to very good effect. That particular painting, more so than any other in the show, also makes a strong nod toward abstraction; the grid is completely frontal, lines up precisely with the left-hand edge, and the proportion of the individual glass bricks is roughly the same as the overall shape. As much as I enjoyed the show, the paintings of landscape, bereft of that weird contrast between subject and surface, didn’t resonate quite as strongly.